Small, in stand operating harvesters and forwarders are rather popular in Sweden. They are mainly used for thinning operations in young stands. Terri 34C is one of those small machines used. Terris small forest machines have been around since early 70s. First manufactured in Finland but since 1995 they are produced in Sweden. Today by the company Alfing in Älmhult. 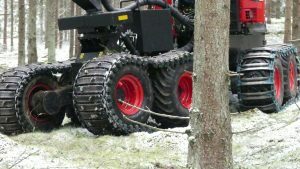 Until 2017, all Terri machines had belts instead of wheels but at the Elmia Wood show in 2017, Terri launched a new 8 wheeled machine. So today, Terri offers both belted and wheeled machines in forwarder, harvester or combi versions. Small machines in second thinning? Looking at capacity, the small in stand operating harvesters like Terri 34C, Malwa 560H or Vimek 404 are more or less competitive with larger, strip road operating harvesters. At least in early thinning with small diameters. But there has been a frequent spread opinion that those machines are not able to do the second thinning. 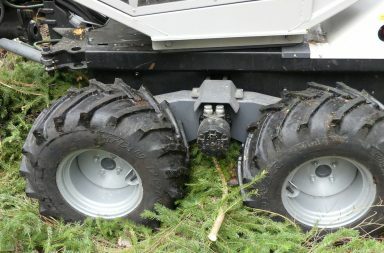 As forest owners don’t want to cut new strip roads late in the rotation period the recommendation has been to start the first thinning with a larger, strip road operated harvester. But now manufacturers of smaller machines claim that their harvesters have no problems to do the second thinning. Is it so? 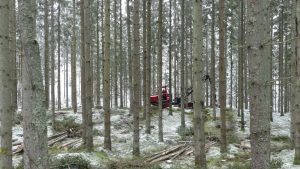 Well, forestry.com went to the forest to see and document some samples of second thinning in Swedish spruce stands. This spruce stand was thinned by the Terri 34C. It will now grow another 20 years until final felling. This first example is thinned with a Terry 34C 8wd harvester. The stand is a spruce stand (Picea Abies) on good soil in south Sweden. Age 45 years and largest trees is some meters over 20 meters height (72 ft+). The stand has been thinned once for eight years ago and there is a network with small strip roads the harvester can use. The larger main stems is almost 30 cm in DBH (12 in) but the stems cut in the thinning is 16 cm (6 in) or smaller. The harvester version of Terri 34C 8wd has a Mowi P400T-crane which has a telescope extension and a total reach of 7,5 meters (25 ft). Tracks on all bogies gives the harvester some extra weight and stability also on full crane extension. 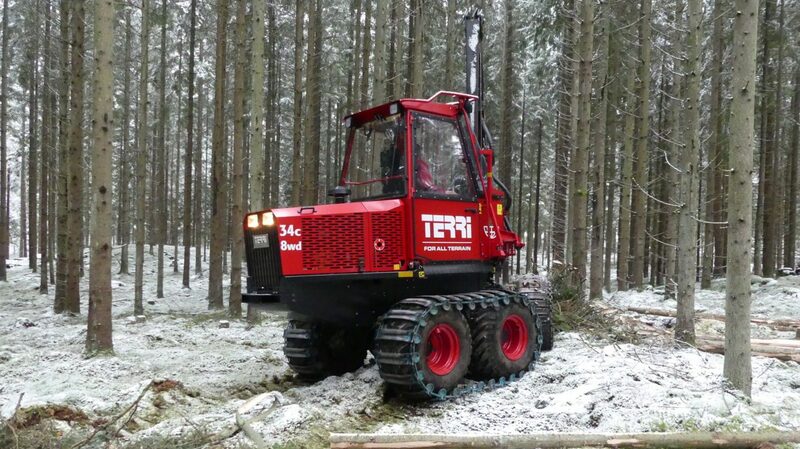 The Terri 34C harvester is equipped with a LogMax 928 head that can cut up to 42 cm (17 in) when felling the trees. The existing strip road system in this stand has a cc distance of 22 meters (72 ft) which exceed the reach of the Terri 34C. But this is easily solved as the harvester makes perpendicular “inserts” between trees at the roadside to reach some meters extra. You can see how it works at the video below. Before thinning there was apr. 1200 stems/hectare (apr. 500 st/acre) in this stand. 400 st/ha (160/acre) was cut and the average trunk volume was 0,14 cubic meters under bark (140 liters ≈ 5 cubic ft/stem). The removal was only 20% of the standing volume and next step for this stand will be harvest by final felling within some 20 years ahead. As i looked and spend time shooting this video, the harvester worked easily and smooth cutting in the stand. 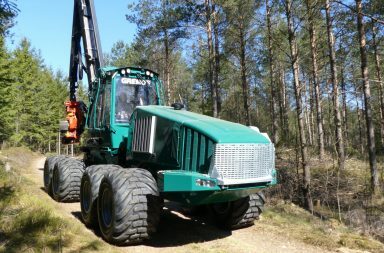 This machine has no problem to deal with trees in the actual size. Back home and looking through the video clips, I logged the production pace of the harvester. The average production level vas 90+ trees per hour. It will be something like 12 cubic meters (under bark) per hour but, of course the utilization might be a little bit lower. 12 cubic meters/hour might be like 10 tons of pulpwood/hour. Is it possible to use the Terri 34C in second thinning? The answer is absolutely yes! The machine has no problems to handle the tree dimensions and the production pace is on a competitive level. 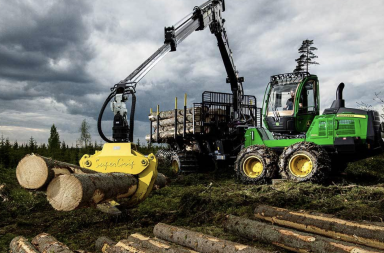 But when it comes to transport the wood harvested, it might be a little bit more costly to use small machines. As the Terri 34C forwarder only takes 5 cubic meters (4,5 -5 tons) payload it has only the half size of a traditional, strip road operated forwarder. Like the Rottne F10 or the John Deere 810E. Even if the smaller machines are cheaper with lower hour cost rates, this makes the hauling more expensive anyhow. 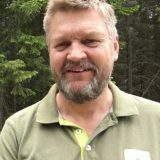 In Swedish conditions it might differ 3-5 US $ per cubic meter (3-5 US $/ton) on shorter hauling distances (up to 3-400 meters/330 – 440 yds). 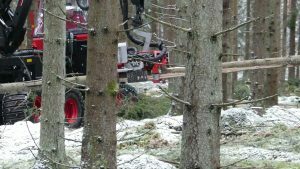 Even if the total logging cost will be higher, many private forest owners in Southern Sweden prefer to use smaller machines in their thinning. The main reason is that they expect more and better stems left to the final harvest. 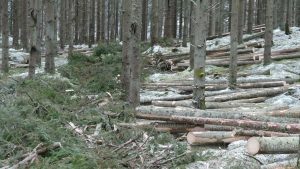 Private forest owners also consider narrow machines and narrow “strip roads” will reduce the risk for storm felling of recently thinned stands. And here is some more pictures of the Terri 34C 8wd harvester doing second thinning. 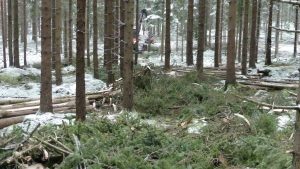 The narrow strip road to the left and harvested spruce wood to the right. The Terri 34C harvester is equipped with a LogMax 928 harvesting head.